Job Analysis is the process of researching and identifying the essential elements of the job and the role or function that the job plays within the organization. It seeks to answer the following questions: Why does the job exist? What are the critical functions that the job accomplishes? How does the job relate to other jobs within the department and company? In other words, what purpose does the job serve and where does it fit into the hierarchy of jobs within the organization. The primary reason to analyze jobs is to obtain accurate and up-to-date information in order to document job responsibilities and job requirements in the form of a job description. Additionally, identifying job elements and requirements is essential to many other HR functions including recruitment, selection, training, compensation, performance appraisal and career planning programs. 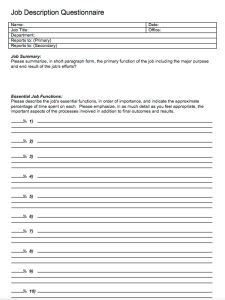 The information needed for Job Analysis may come from primary or secondary sources. Primary sources include job questionnaires and interviews with the job incumbent and/or supervisor. Secondary sources used to supplement primary information may include organizational charts, department or operations flow charts, and reference materials including job descriptions for the same or similar job from comparable organizations. 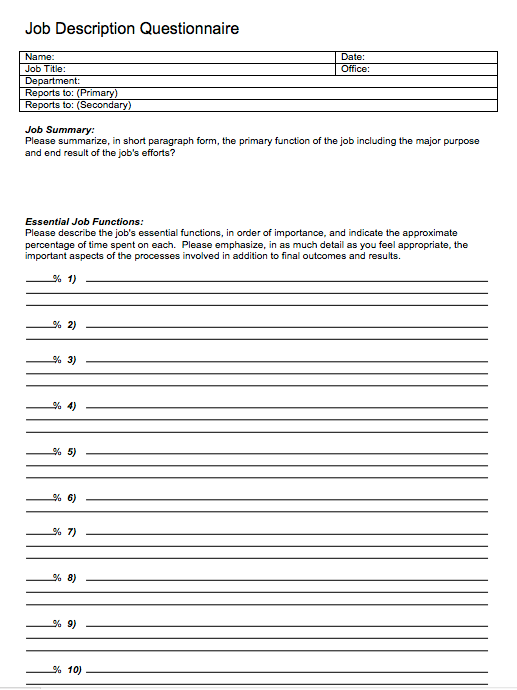 A Job Questionnaire that is completed by the job incumbent or supervisor is perhaps the most widely used technique to obtain job analysis information. The questionnaire asks for a brief description of the job’s responsibilities and other information pertaining to the job’s requirements. If job questionnaires are used in conjunction with interviews, they should be completed prior to the interview so that information may be verified, clarified and expanded upon during the interview process. Questionnaires completed by job incumbents and used as the sole source of job analysis information should be reviewed by the supervisor for accuracy. When a job has multiple incumbents, questionnaires should be given to as many job incumbents as feasible or a representative sample at a minimum. The job analysis interview provides an opportunity to obtain in-depth information pertaining to specific KSAs (knowledge, skills and abilities), training requirements including any special certifications, internal/external contacts, reporting relationships, amount of supervision given and received, decision-making authority, impact on others within and outside the organization, workplace environment and physical demands (i.e. lifting, moving, operating machinery, driving). These elements of the job are considered to be “compensable factors” and as such are important to capture these during job analysis so that they may be documented in the job description. 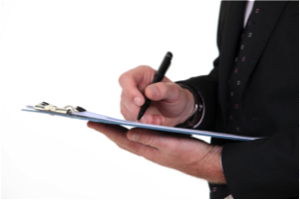 For further information on compensable factors, please see the article on Job Evaluation. It is important to keep in mind that the purpose of job analysis is to describe the job, and not the person doing the job. If there is only one person in the job, you should attempt to describe the job as a function of the organization, and not as the performance of the current job incumbent. If you have a multi-incumbent job where some individuals perform the job better than others, you may want to find the middle ground between the high and low performers and describe the job as the average incumbent performs the job’s functions. In all cases, it is best for the job analyst to think of the job as if it were vacant and imagine what the ideal candidate should bring to the job in the way of knowledge, skills, abilities and competencies in order to perform the job at a fully satisfactory level. Job Analysis is a time consuming process but the results have many benefits to the organization as they lay the groundwork for numerous other HR programs. The outcome of the job analysis process is an accurate, defensible and up-to-date job description, the elements of which will be covered in the next article.